I can only tell you very little about this magnificent piece in St Werberghs tunnel. It is by dmunk13 who was painting with six other writers, mostly from Bristol, a week or two back. He has an Instagram account and from that it looks very much like he is a tattoo artist who, like so many others, hits the streets from time to time. I think this is a really wonderful piece in so many ways. The colour selection works well for me. The combination of skilful 3D writing together with a fabulous crow head, wearing an orange beany, and why not. The letters are disguised and I think spell out MUNK, but not necessarily in that order. There is more writing in the cloud, which I think mirrors the 3D writing. Finally what self-respecting piece with a character doesn’t have it holding a spray can. This crow is gooood! One of the truly outstanding and memorable pieces of Upfest 2017 was this extraordinary image of an infant holding a spray can. The artist, Mon Devane, comes from the city of Ourense in Galicia, Spain. Taking a look at his website, you can see that he has a strong and recognisable style, using a monochrome style on vibrant backgrounds. There is nothing subtle about his pieces, they are bold statements, and beautifully crafted. I do like it when street artists incorporate a spray can into their art, like the old masters including a paint pallette – the tools of their trade. I think that this might have been one of the most popular pieces from the Ashton Gate wall (although there were so many great pieces there), simply because of its instant impact. 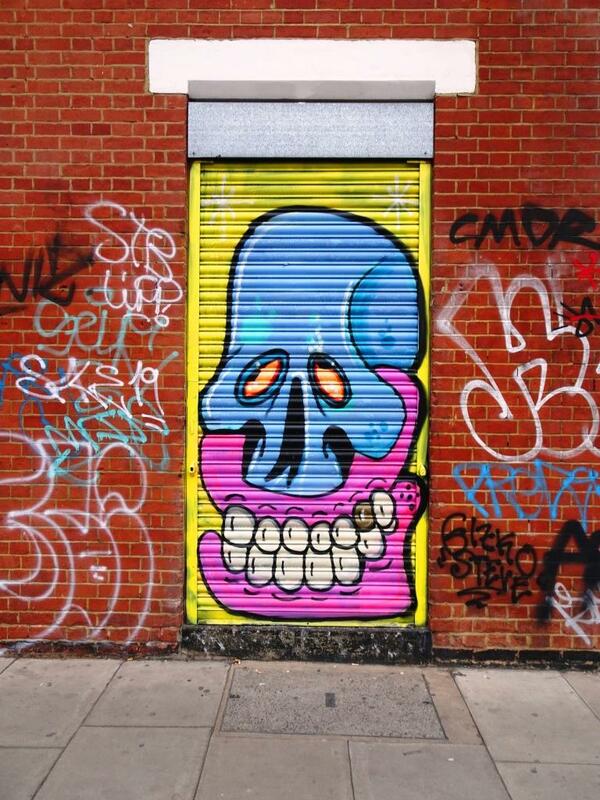 A theme used by many street artists is the depiction of a monster – I guess this is so that they can be creative and use their imagination as there is no template for a monster really.Another common theme is to seen a character using a spray can. This monster piece by NEVERGIVEUP in The Bearpit brings these themes nicely together. NEVERGIVEUP is taking over the mantle of most prolific artist in Bristol and is varying his style, which started with his customary bunnies. He is a versatile and young artist and I’m sure will develop his styles over time. He is certainly fearless in spraying walls not previously sprayed, but is respectful of other’s work too. The Bearpit has had a little bit of a renaissance since Upfest, and there are som decent works there, in amongst the throw ups and tagging. On Raleigh Road, just opposite the Tobacco Factory, is the car park for a small company called Vector. There are four available walls in the car park which are frequently sprayed…the turnover here is very high. I have only ever been there when the car park gates are shut. This is both good and bad. It is good because there are no obstructions in front of the cars. It is bad, because I have to photograph through the railings and for the walls on the right hand side, I only ever get oblique views. It will be one of the venues for Upfest 2016. I took this photograph recently, but already it has been replaced. This is a lovely work by Cheo. This is one of his busier pieces, with so much going on in the mural. Unusually, he appears to have abandoned his bee in this work and replaced it with an animated spray can. It is always good to see Cheo busy on the streets.